From Genesis through Revelation, Scripture uses the image of a lamb as a type of Christ and a metaphor to illustrate how Jesus, our sacrificial Lamb, secured our salvation. 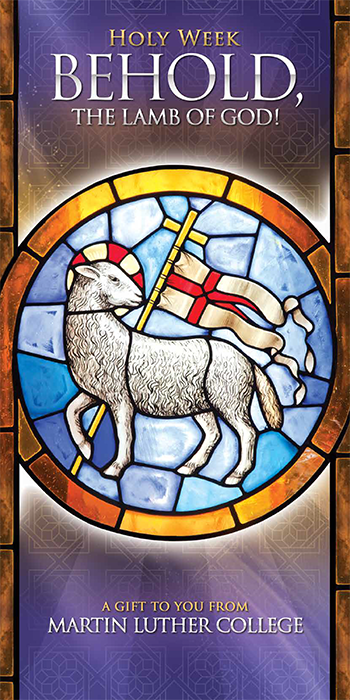 The eight devotions written by MLC faculty tell the story of the Lamb in prophecy and fulfillment, from Mount Moriah to Mount Zion. Request a print copy to be mailed to you. Receive daily devotions by email during Holy Week. Listen to podcasts online – NEW! Reformation 500 – I Shall Not Die, But Live is MLC’s 2017 devotion book containing thirty-one uplifting messages as a gift from the Martin Luther College campus family. We pray that our Lord would strengthen your faith through his Word. Lent 2017 – Lenten Truths from Unwitting Witnesses contains eight uplifting messages, for Palm Sunday through Easter Sunday. This beautiful book is enhanced by the artwork of Lucas Cranach, Reformation painter and friend of Martin Luther. Advent 2016 – Isaiah Had Foretold It is MLC’s Advent 2016 devotion book, this one containing 25 spiritual encouragements, one for each day of December until Christmas. Advent 2015 – The 25 devotions in this booklet were authored by current students at MLC, as well as pastors, teachers, staff ministers, and lay leaders who have studied at MLC. They are intended for use December 1-25. Holy Week 2015 – The eight devotions in this booklet were authored by MLC professors. All expound on Old Testament lessons and are intended for use from Palm Sunday through Easter Sunday. Christmas 2014 – The thirteen devotions in this booklet were authored by President Zarling and 12 MLC graduates serving throughout the synod’s 12 districts. They are intended for use from Christmas Day through Epiphany (Dec 25-Jan 6). Holy Week 2014 – The eight devotions in this booklet were authored by MLC professors. All expound on New Testament lessons and are intended for use from Palm Sunday through Easter Sunday. Receive a daily devotion in your email inbox. Our first Holy Week devotion will be released on April 14. Devotion booklets available while supplies last. THE ADVENT 2018 AND HOLY WEEK 2018 BOOKLETS ARE NO LONGER AVAILABLE.